The V-Tech Line Touring windscreens from Puig it's been tested in a wind tunnel to optimize the aerodynamic coefficient. Thanks to that, it's possible to decrement the pressure of the air against the pilot when driving. They have dimensions mostly greater than the one that came with your bike and its angled design redirects the air away of the driver besides offering you a more aggressive finish. 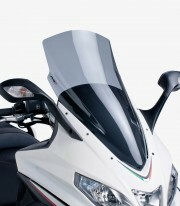 It is calculated that on average the aerodynamic is improved by 24% with the V-Tech Line Touring windscreens. The measures of this wind shield are: 700mm wide by 350mm high.